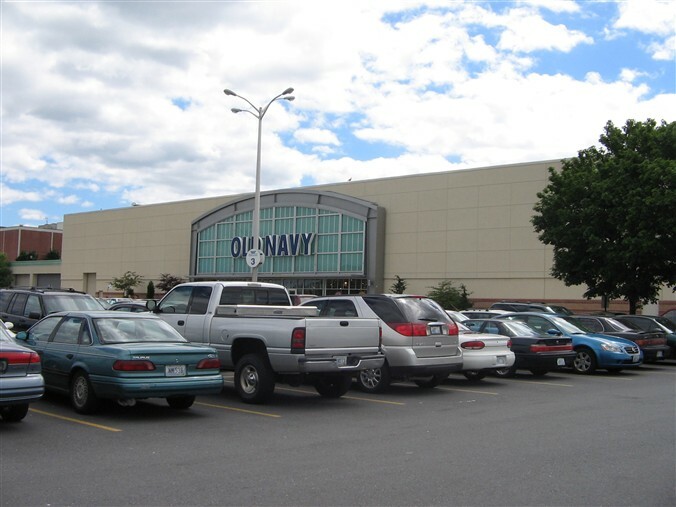 Jordan’s Furniture, a New England chain of large, destination-oriented furniture stores, is moving into the former Caldor/Old Navy store (pictured above) in the Warwick Mall in Warwick, Rhode Island. Furniture shopping remains a tactile experience, according to an industry spokeswoman, as American consumers still like to see and touch furniture pieces before buying them. Jordan’s is well known for its splashy store layouts — one has an IMAX theater, another has a trapeze school. Eliot Tatelman, Jordan’s president and chief executive officer, declined to say what people will find in the Warwick store when it opens later this year. Jordan’s stores are typically very, very large, so this will be one of the smallest stores (if not *the* smallest store) in their portfolio, and their first in Rhode Island. In other news, it was announced only a few weeks ago that the adjacent, long ailing, and almost completely vacant Rhode Island Mall–the oldest two level mall in New England and the only one designed by Victor Gruen–will finally be put out of its misery and shuttered on April 30. Is Jordan’s Furniture to furniture as Bass Pro Shops is to sporting goods? @Pseudo3D, Actually, that’s a pretty good analogy. Their stores are major destinations and always feature a kind of carnivalesque atmosphere. It’s interesting that they’re moving into malls, since they’ll actually act as a good anchor draw (despite being, fundamentally, a furniture store). Warwick Mall’s anchors now will be Macy’s, JCPenney, Target, Sports Authority, Jordan’s Furniture, and a smaller Old Navy, which is a pretty interesting roster. @Caldor, How does Jordans compare to say Crate & Berrel or IKEA wich are in there own right destinational as well. @SEAN, their stores are comparable in size to an IKEA, though the goods are much different (generally somewhat higher-end though still more or less mid-range, whereas IKEA’s stuff is largely somewhat budget-conscious). Crate & Barrel and IKEA also both sell generally more fashionable stuff than Jordan’s, whose furniture stock is a bit more classic. The biggest difference really is that Jordan’s is a massive full-line furniture retailer that doesn’t have a particular aesthetic like C&B or IKEA. You can get 19th century farmhouse stuff or you can get uber-modern 21st century stuff or you could get a La-Z-Boy and everything inbetween, separated out into different rooms. @Caldor, In your opinion do you think Jordans could work outside New England in other malls with dead anchors? If so where, since anchor spaces are getting harder to fill. Retail stores that carry large furniture, food, clothing, shoes, gas stations, cleaning supplies (look at the down trodden dollar stores that have cropped up), will survive and grow. I also predicted in 1998 that video arcades would die out and be replaced by physical games, which they have. Yes this is like duh now, but 12 years ago, did anyone think Circuit City and Good Guys would disappear? What is gone now? most gift stores, Borders, Blockbusters (most), stores that sell items that can easily be shipped and have no “service” to offer. What is in bankrupsy now? Corporate Round Table Pizza chain. Want a prediction going forward? Kmart stores will morph info some type of business that provides service along with what things they sell. There will be a business that focuses on teenagers and 20 somethings to mingle and actually have meaningful relationships which do not use any electronic devices whatsoever. What a concept, no? I see Rite Aid gone, CVS gone, Ross dress for less growing, and strangely I see hardware stores picking up and growing, leaps and bounds. Apple computers will overstep their proprietary-ness and people will turn away from them and their control and more towards local social media offerings. Also, still more Hamburger and Fries, diner type restaurants are coming such as Five Guys Burgers and Fries, In and Out, etc…..sigh…..barf. @JBN, well, at the rate of the Internet what with politicians eager to slap some sort of tax on items, and the cutting of SKUs from discount stores (Some of Walmart’s stores will not get back the missing SKUs because of reorganization) might recover some of the specialty stores, but that would only happen if malls would swallow their pride and allow those types of things in. If Kmart gets its act together and focus on something like new Mygofer stores or something, we might see them do that. @Pseudo3D, SK US? What is that. @SEAN, SKU refers to a number given to a unique product at a store. @Pseudo3D, Oh yeah! Thanks, I forgot about that. It was the way my computers speach software spoke. @JBN, ..may want to scratch In-N-Out from that list. True they ARE expanding ( Texas ) but OTOH there are a number of markets where they are just not welcome to enter..but for an odd reason. Take Denver for an example. With so many people there who are from California ( and many more who do business there )..on paper an In-N-Out for Denver would seem like a very good idea. BUT for some reason there are alot of people who just don’t want them in Colorado. Denver’s KOA radio did a show about this a few years back. I still recall that caller from Fort Collins “..hey I LOVE In-N-Out Burger..hell YEAH..But plase don’t let them come to Denver !!”. I don’t get it. Maybe people feel that something will be “missing” if an In-N-Out would build in Denver, Kansas City, Cincinatti or wherever. On a similar note and more on this topic is the Denver based American Furniture Warehouse. ( AFW )Ever since my husband and myself had mioved to Colorado we had heard rumors about how AFW will enter some of the Denver area malls. Of course it hasn’t happen, not yet but like In-N-Out Burger & Denver, no shortage of those who say they that will NEVER EVER shop at an AFW again IF they would open a location in a mall. Near a mall..OK but not inside. Kinda scratching my head on that one. In-N-Out I think decided not to come to Denver because we don’t have adequate availablity of the kind of produce they want to put on their burgers, and it’s too expensive to send in. I would not mind AFW in a mall, but I also don’t think there’s a real need for them to be in one. They would be a decent fit for Westminster, except that they already have a satellite store only 2 miles away as well as their main warehouse on 84th and Grant. Flatrions is basically full, the Ultimate Electronics dead anchor is too small for them. Park Meadows is full, Southwest and Aurora have full anchors and not enough dead inline space, the Mills is basically full (even though it’s also kinda’ dead), and Cherry Creek would probably rather just tear down the empty anchor than have them fill the Saks Fifth Avenue vacancy. Furniture stores have been in shopping malls (enclosed and otherwise) from the beginning. They have never entirely disappeared although they mostly turn up at larger and more upscale malls like Tysons Corner (which has Aarhus) and often carry other lines (think Pottery Barn, Restoration Hardware, or Crate & Barrel). In major markets, furniture has never disappeared from department stores in malls, either. @Rich, this is true, but what’s different about Jordan’s is that their stores are very very large and they don’t really sell any smaller products the way that, say, C&B does. It’s pretty much all furniture. But their stores are by design built for browsing and more frequent visits (hence all of the additional “attractions” they throw in) so they’re a good fit for a mall. @Caldor, Any chance Jordan’s comes to the New York metro area? And I also know of another case of a furniture store opening in an enclosed mall: a year or two ago, Warren, MI-based Art Van Furniture opened their first mall-based store at Great Lakes Crossing Outlets (which looks exactly like a “____ Mills” mall even though Mills didn’t build it) in Auburn Hills, MI, in the former Circuit City (unless I’m wrong about the location).